Along with his health quickly deteriorating, Vietnam veteran Roberto Gonzalez had only one wish: to find out and hug his two beloved horses, Sugar and Ringo, any time. 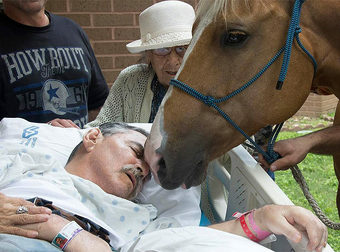 Hospital staff chose to grant his wish and also the two horses traveled 150 miles to visit him at the Audie L. Murphy Memorial VA Hospital in Washington, Texas, where he was battling liver and kidney issues. Gonzalez was paralyzed in 1970 after he was shot 60 days into serving in Vietnam. But despite his injury, Gonzalez made a living from his passion to the majestic animals and is amongst the only registered horse trainers in Texas who is disabled. Essentially in this heartfelt video, seeing his prized horses one further time meant something to him.